Whatever possessed me to decide to make a coat during this hot, hot Summer? Actually, I have a (somewhat logical) answer to that question! For starters, it’s a raincoat. And how I came to sew a raincoat is a good example of what keeps the wheels in my head turning! While perusing the website for Britex Fabrics last Summer, I came across its offerings of rainwear fabrics. Just out of curiosity, I took a look at them, and I was immediately smitten with the “French Winter White Water-Resistant Rainwear Fabric”. The woven “wave” design in this fabric really caught my attention. 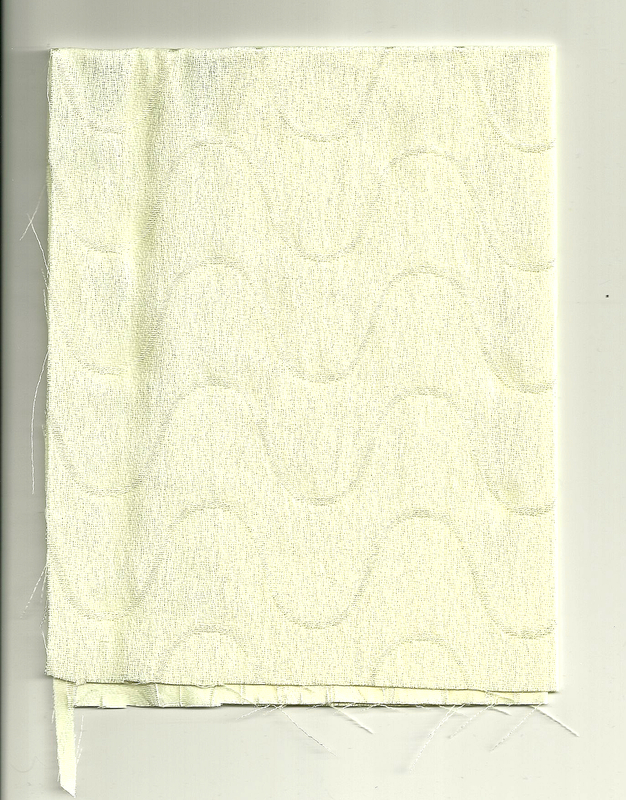 I sent off for a swatch, which confirmed for me the graceful woven design and lovely creamy color inherent in this fabric. A subsequent trip to California gave me the opportunity to see the fabric in person, and I decided it was time to “commit”! 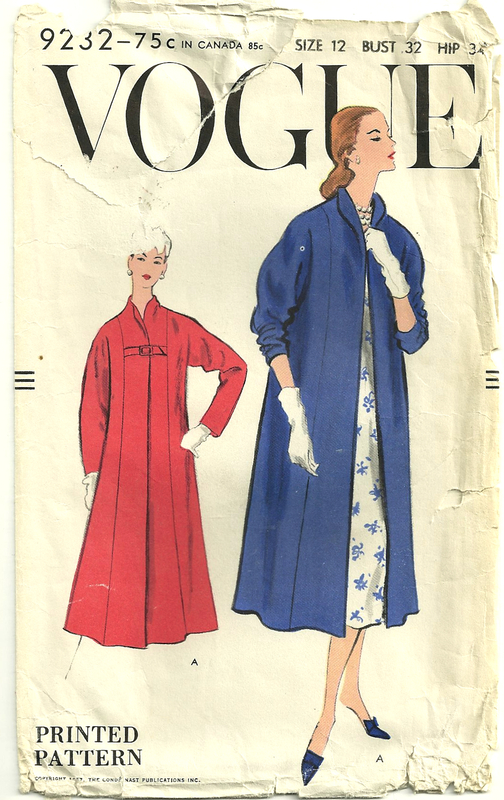 I had frequently felt the need for a “dressy” raincoat, so I thought, “Why not make one?” I also knew I had the perfect pattern – this “swing” coat design from 1957. I remember swing coats from my childhood – and now I have one! 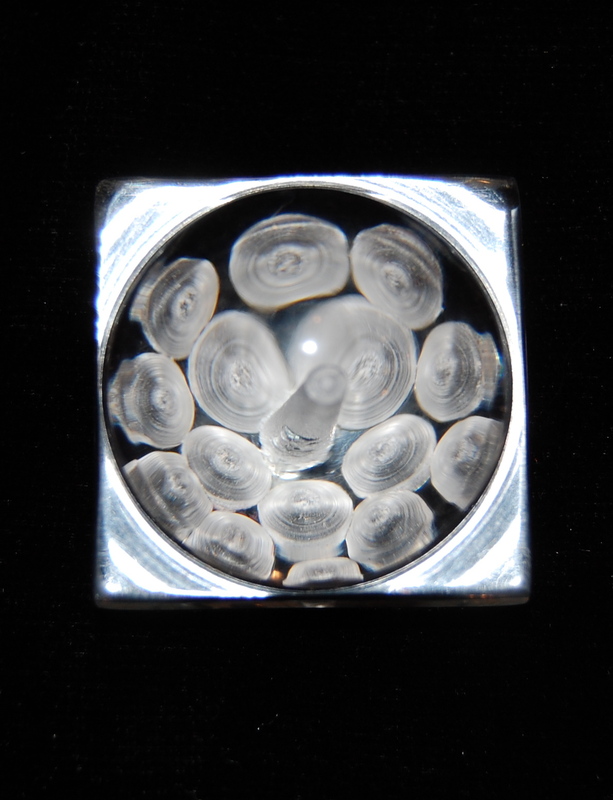 I placed this button on a piece of black velvet so that the design would show up. It is a little more than an inch square in size. The design in it reminded me of raindrops – perfect for a dressy raincoat, and, I thought, a perfect complement to the fabric, already in my possession. 1) I took a little fullness out of the front side panels. 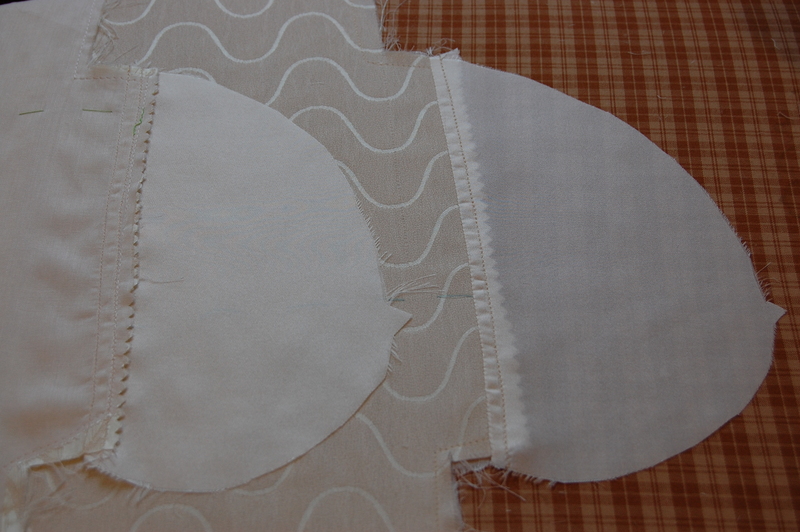 When I made a muslin mock-up of the pattern, it just seemed a little too full for my frame. 2) I added pockets to the side seams. I can’t imagine any coat without pockets, but a lot of the vintage styles (dresses and coats) did not have them. 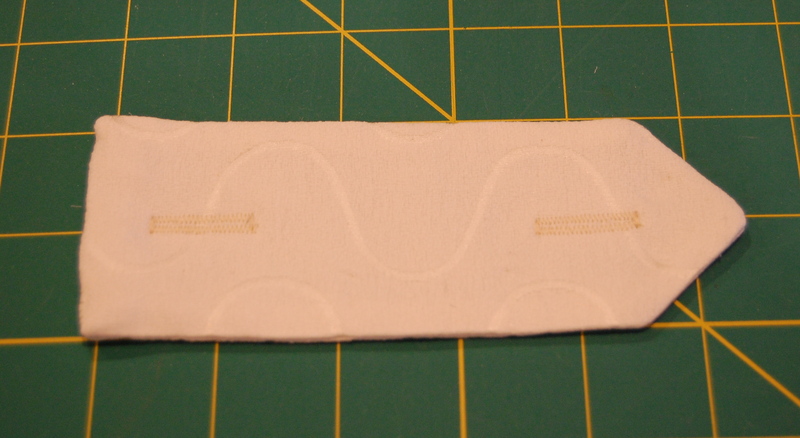 Here is one of the pockets under construction. 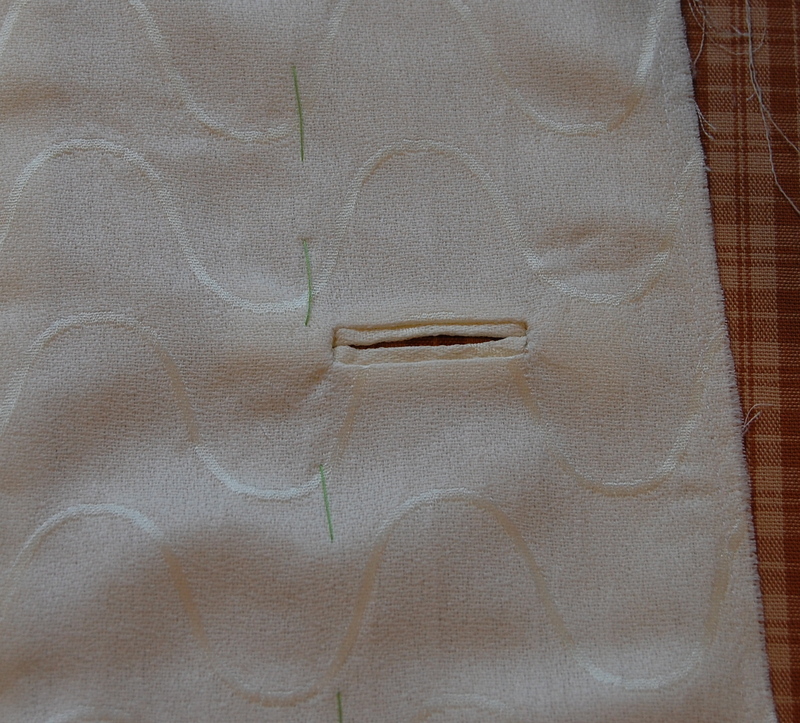 Here is the bound buttonhole placed in the front right section – before the facing is attached. 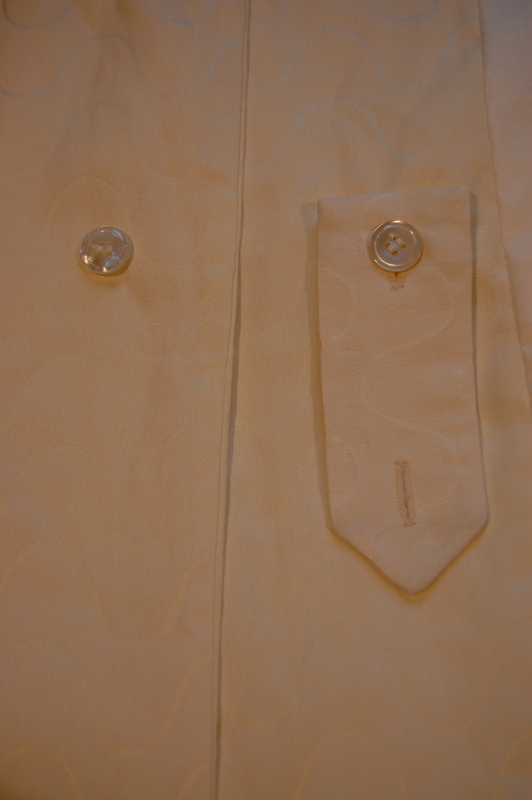 Here you can see the button and finished buttonhole. Click on the photo to see it in detail. I made a “tab” with buttonholes on each end. I made machine buttonholes in the tab. I placed the buttons for it on the inside facings on either side of the coat, about halfway between my waist and my hips. It can easily be buttoned to secure the coat, and when I unbutton the left side, the button on the right side allows it to fall down, hidden from view, but easily accessible. 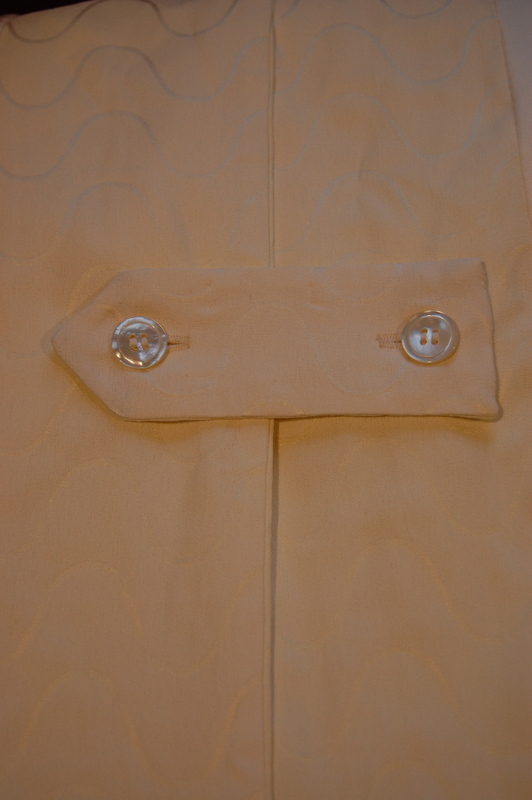 This shows the inside of the coat, with the tab buttoned. 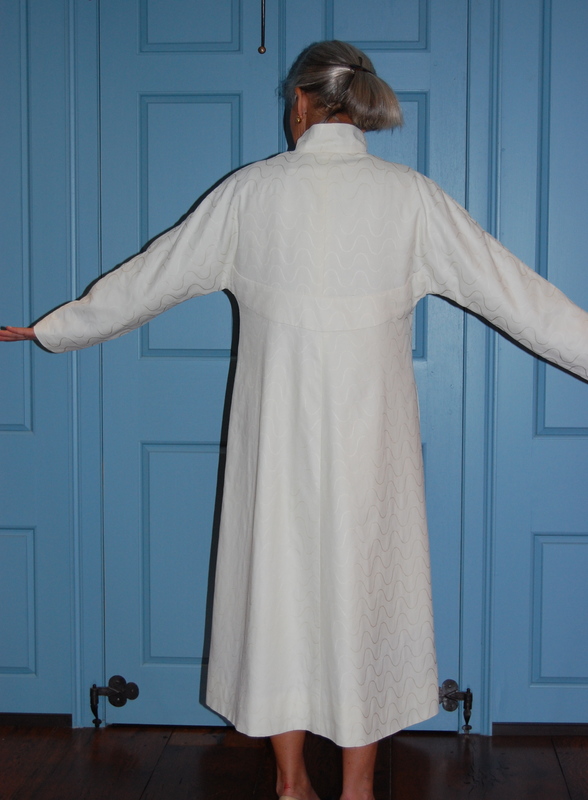 And this shows the tab unbuttoned on one side and hanging down, out of sight – inside the coat. 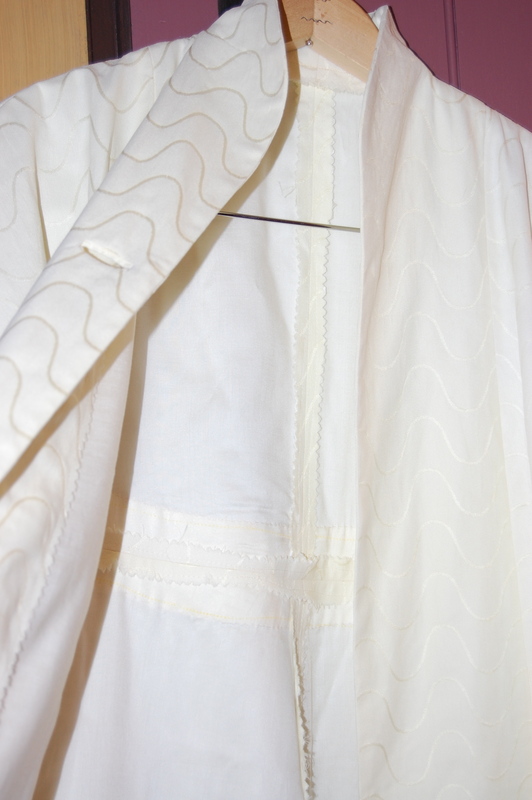 A few more details about construction: The rainwear fabric is an acetate/rayon blend which I underlined with rayon voile. 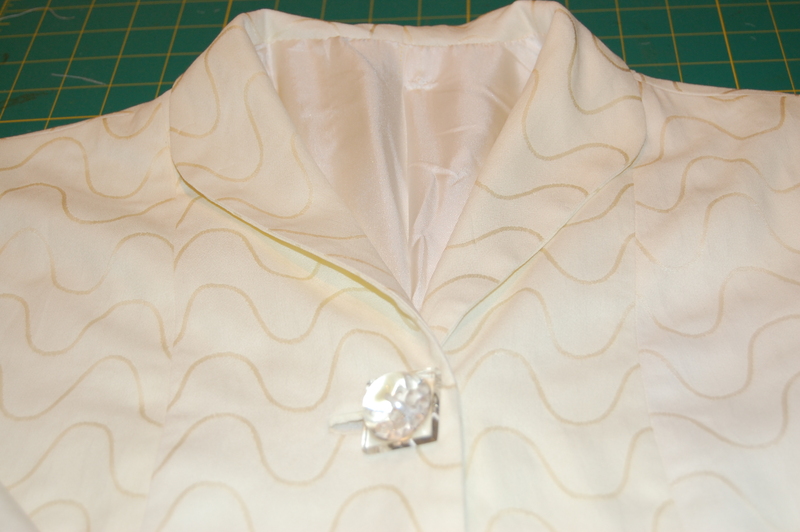 Here is the coat, showing the underlining, before I attached the lining by hand. 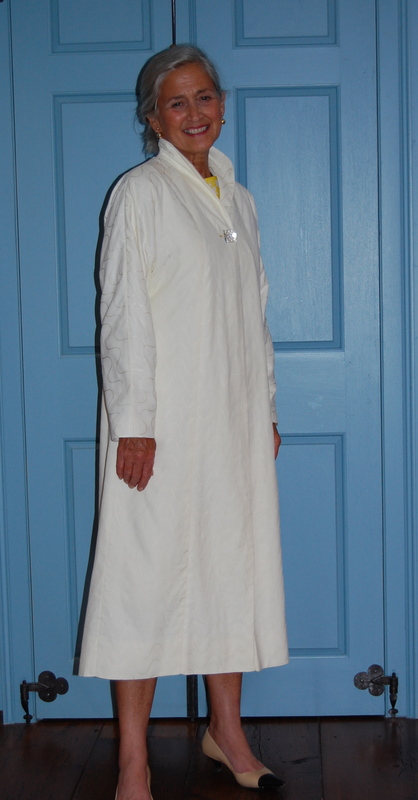 I lined it with a pure silk lightweight twill in white. I would have loved to have lined it with a neat polka dot silk, but I didn’t want any “shadows” of a printed lining to show through. Guess I’ll just have to dress it up with polka dot scarves instead! The rainwear fabric was very easy to work with – surprisingly easy, actually. It drapes beautifully for a pattern like this. Speaking of patterns, this one was so precise and cleverly engineered (especially the collar), turning it into a really fun project! Hopefully you can see the “belted” back in this view. Making a garment like this during the Summer months means that I had to be prepared for “delayed gratification” as I probably won’t have a chance to wear my new raincoat for at least a couple of months. However, when a future Fall or Winter forecast is for “Chance of Sprinkles” – or even full-force rain – I’ll be ready!